Feng Liu is a researcher at AIR. His experiences include the employment of advanced research and evaluation methods and statistical modeling in education and social science, online learning success and the effectiveness of virtual schooling, technology integration in school learning environments specifically in Science, Technology, Engineering, & Mathematics (STEM) related fields, and e-game/simulation in education. Dr. Liu has served as a research analyst or project liaison on experimental and quasi-experimental studies for statewide and nationwide research projects including the IES funded project, Indiana’s System of Diagnostic Assessments on Student Achievement Outcomes; NSF funded project, The Cryptoclub: Cryptography and Mathematics Afterschool and Online; and 21st CCLC Evaluation projects for the state of Oregon, New Jersey and Washington. Feng Liu has conducted survey scaling work using Rasch modeling for several projects including College Summit Program Evaluation, ASCD Whole Child Network of Schools (WCN) Program Evaluation, and Hewlett Deeper Learning. 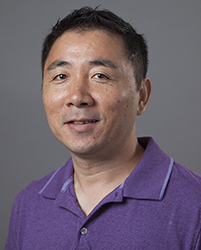 Prior to his position at AIR, Feng Liu was a postdoctoral associate and worked as a research analyst on the evaluation of Charting a Course for the Digital Science, Technology, Engineering and Mathematics (STEM) Classroom program (part of EETT project) at University of Florida. He has more than 5 years of experience of survey validation and design and advanced data analysis and has published research articles in variety of academic journals and presented his work at numerous conferences. Feng Liu has taught computer science courses at the post secondary level in China for eight and half years before he came to the U.S.